Situated in the Sossenheim district of Frankfurt am Main, 10 kilometres from the city centre, this guest house offers comfortable accommodation and free Wi-Fi internet access in its public areas. 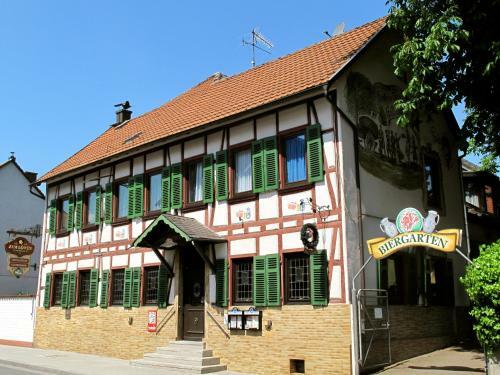 The cosy rooms of the Gasthaus zum Löwen provide an ideal base for exploring the city, visiting the exhibition grounds or discovering the beautiful countryside of the Hoch-Taunus Nature Park. Start your day off with the complimentary, continental breakfast in the morning and look forward to some good, home-style cooking in the restaurant each evening. During the summer, why not enjoy your meals and refreshments outside on the garden terrace. Guests travelling by car will appreciate the free, on-site parking provided by the Gasthaus zum Löwen, as well as easy access to the A66 motorway and Höchst industrial estate (3km). Please note that check-in is only possible from 17:00 until 22:00. Guests arriving outside of these opening hours are kindly requested to inform the hotel in advance. Contact details can be found on the booking confirmation. Cosy room featuring a TV, and an en-suite bathroom.